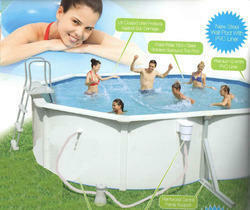 We are offering Metal Pool to our clients. We are engaged in offering Metal Pool. Crystex coat textured all weather sealant. Hot dipped galvanized steel enamel painted. Copper bearing alloy, alkaline cleaned Weather protective epoxy shield Zinc bondrised coating & chromic seal. And Warranty for this pool is 20 years.